Sign up for free and just shop with DFDS Seaways as normal. Our average member earns over £300 cashback a year. Cashback on Dover crossings is only valid on bookings to Calais or Dunkirk. DFDS Seaways cashback can be earned simply by clicking through to the merchant and shopping as normal. DFDS Seaways Cashback is available through TopCashback on genuine, tracked transactions completed immediately and wholly online. One of northern Europe's largest ferry operators, DFDS provide eight passenger routes, including four between the UK and the continent, as well as freight shipping. They have been in existence for more than 150 years and offer competitive fare prices, good onboard facilities and excellent customer service. If you are travelling from the UK, you and other passengers can make use of crossings from Dover to Dunkirk and Calais, Newhaven to Dieppe and Newcastle to Amsterdam. If you are planning on travelling a little further afield, meanwhile, you can gain easy access to the Baltics and Scandinavia via their routes between Norway and Denmark, including Oslo-Copenhagen and ferries which link Germany and Sweden with Lithuania and Estonia. 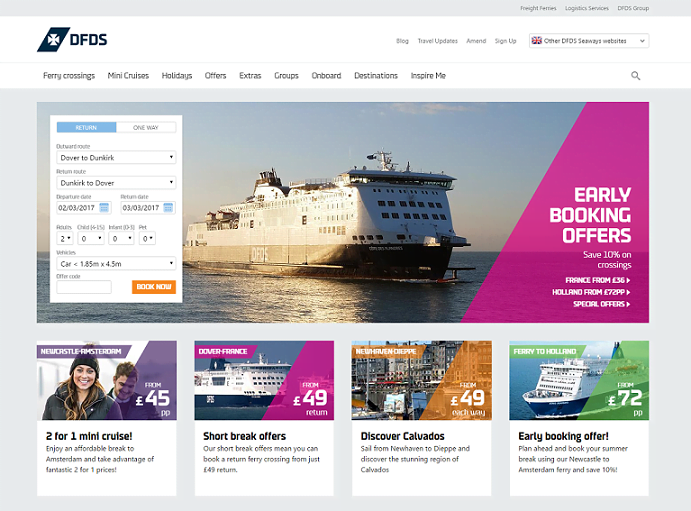 Browse some great DFDS offers and check availability of suitable departures, while if you are not already a TopCashback member, sign up using the form at the bottom of this page and you will find DFDS discount code and cashback deals which will allow you save money on bookings. Take your own car on one of their crossings to Europe and you can discover thrilling cities like Amsterdam or Paris, explore the German countryside or gasp at the dramatic scenery of the Alps at your own pace. Whatever you fancy, there are plenty of ferry booking options and DFDS offers to choose from. For family holidays, you can opt for an outdoor adventure at Center Parcs or spend your time relaxing and seeing the sights in a Pierre & Vacances apartment. Through their partner, Booking.com, couples can tailor their own holiday, or if you are looking for a great value self-catering city break, why not book an Adagio apartment? If your ideal holiday involves travelling around to different places, their Great Journeys touring routes are ideal, and you will be provided with suggestions on what to see and where to visit. Their touring routes are available in five European countries, including France, and are inspired by the history, culture, food and drink of each. You can also travel from Newcastle to experience a Christmas market in Cologne, Lille or Bruges during the festive season, spending two nights on board. If you are thinking of taking a trip to The Netherlands, their Newcastle to Amsterdam mini cruise deals and short breaks are ideal for a family, couples or group of friends. All of the great value trips, which allow you to relax on board yet still experience something of a city break, include coach transfers to your destination from the port. As well as being able to spend five hours in the Dutch capital before you return, you can make the most of the excellent facilities during your two nights on board the ship. However, if five hours is not enough time for you to explore Amsterdam, why not book a packaged hotel break, which includes bed and breakfast accommodation for one night or more in one of their selected hotels. Opt for a cruise and stay break, meanwhile, and you can book your own accommodation. Ensure you get the most out of your crossing, break or holiday by choosing from a range of optional extras which are sure to enhance your trip. For your crossing, be it from Dover to Dunkirk or Dover to Calais, you can arrange pre-booked meals, priority boarding and access to a Premium Lounge, as well as upgrade your cabin and arrange for room service. When it comes to the trip itself, they also offer competitive insurance and breakdown cover for your peace of mind if you are going to be driving vehicles during your trip, plus tours and attraction tickets to help you make the most of your time ashore. Treat someone who loves to travel to a DFDS Seaways gift voucher and let them set sail to a destination of their choice. Available in denominations of £25 and £50, not only would they make great birthday, anniversary or Christmas presents, but they are also ideal for businesses to use as competition prizes or giveaways. Recipients can put gift vouchers towards any mini cruise or DFDS ferry crossing with a vehicle on their Newcastle to Amsterdam route, during which they will spend two nights on board. They can also be used to save on a hotel or cruise & stay break, or one of their trips to a festive market. To purchase gift vouchers, fill in the online form, stating the amount you would like to purchase (between £25 and £300), and a member of their customer service team will call you back to arrange payment. You can choose for vouchers to be posted to you with a gift card for an admin fee of 50p (£6.50 for recorded delivery), or they can send them by email, either to you or directly to the recipient with a message of your choice for no extra cost. This will be plain sailing if you are looking for a great cashback deal on ferry crossings, mini-cruises, hotels and holidays to France, Holland and Scandinavia. With ferries to France, Holland and Denmark, DFDS Seaways is the world's leading ferry operator. Experience a special maritime atmosphere, professional staff and an international level of service with DFDS Seaways. Browse special offers and book online, and earn rewards.